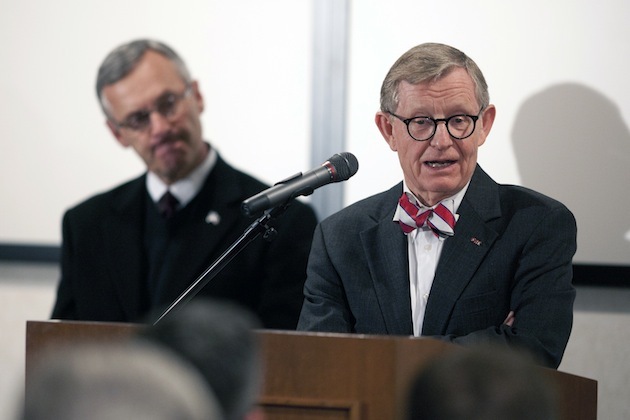 Ohio State president E. Gordon Gee is in charge of one of the nation’s most prestigious public universities, but he also seems to fancy himself a comedian. According to the Associated Press, Gee used a December meeting of the school's Athletics Council to take shots at Notre Dame, the SEC and Louisville. Notre Dame had long been on the Big Ten’s radar as a possible addition during expansion and Gee talked about dealing with the Catholic-based institution during his first term with Ohio State more than two decades ago. Notre Dame ultimately joined the ACC this past September in all sports except football. "The fathers are holy on Sunday, and they're holy hell on the rest of the week," Gee said to laughter at the Dec. 5 meeting attended by Athletic Director Gene Smith and several other athletic department members, along with professors and students. Those damn Catholics, am I right? As if that wasn’t enough, Gee gave his thoughts on rumors of the Big Ten adding Louisville. The top goal of Big Ten presidents is to "make certain that we have institutions of like-minded academic integrity," Gee said. "So you won't see us adding Louisville," a member of the Big East conference that is also joining the ACC. After a pause followed by laughter from the audience, Gee added that the Big Ten wouldn't add the University of Kentucky, either. There’s a Rutgers joke in there somewhere. And of course no public speaking engagement is complete without taking a shot at the SEC. Gee said it was a mistake not to add Missouri and Kansas during the Big Ten’s early expansion plans. Missouri has since joined the SEC. "You tell the SEC when they can learn to read and write, then they can figure out what we're doing," Gee said, when asked by a questioner how to respond to SEC fans who say the Big Ten can't count because it now has 14 members. All of this was said during a closed-door meeting, but the AP obtained recordings. This isn’t the first time Gee has had a foot-in-mouth moment. Who can forget when he boasted about Big Ten scheduling while downgrading the likes of TCU and Boise State by calling their opponents the “Little Sisters of the Poor.” Of course, TCU went on to defeat Wisconsin in the Rose Bowl. Last year, Gee equated scheduling in the Big Ten to the Polish army, which sparked a Polish-American group to call the remarks a “slanderous” display of bigotry and ignorance. Boy, that seems to sum up Gee the past few years. While all of this was said in jest, Ohio State still called Gee's recent statements inappropriate and said Gee was working on a “remediation plan." Gee also sent an apology to the AP. There’s no doubt he’ll also be sending apologies to Notre Dame, the SEC, Louisville and Kentucky as well. Gee shouldn’t have said what he said, especially as the face of the university, and should have known that his comments would get out. The question is, what is Ohio State going to do about it? UPDATE: SEC commissioner Mike Slive said Gee called him a few weeks ago and apologized for his comments, though he didn't say what those comments were.